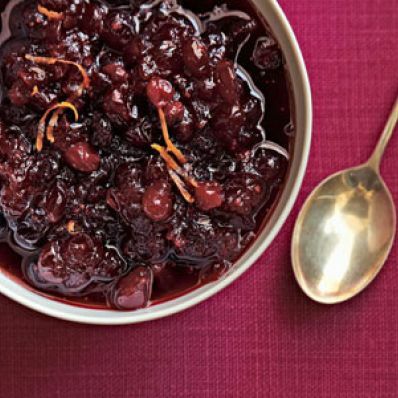 1 of 1 Combine cranberries, sugar, water, orange slice and freshly grated orange peel in medium-size saucepan. Stir over high heat 3 minutes, until sugar melts and water starts to boil. Reduce heat; simmer until thickened, 15 minutes. Discard orange. Pour into serving bowl; cool completely. Per Serving: 40 g carb., 0 g pro., 153 kcal cal., 0 g Fat, total, 1 mg sodium, 0 g sat. fat, 1 g fiber, 0 mg chol.